The profound impact of digitization will thus be felt throughout the entire construction industry. Whichever angle you take – the competitive situation or productivity considerations – companies have no choice but to tackle this vital issue. Those companies that move early to develop and implement their own digitization strategy will be the winners as the construction industry goes digital. The “construction firms of the future” will use digital tools to have materials supplied just in time, thereby cutting the cost of storage and transportation and increasing efficiency. They will source materials with electronic portals and, in so doing, optimize not only their prices but also their collaboration with suppliers. In production, building suppliers will deploy smart machinery and applications that forge networks in which all production processes are planned in advance and operated with optimal efficiency. In marketing and sales, they will win over dealers and customers with digital sales applications. In after-sales, they will provide customers with new service and support that increases customer retention. Building material traders will operate efficient platforms that add transparency while also making their customers’ processes more efficient. At the same time, they will harness the data generated to gain a better understanding of their customers and produce customer profiles. The possibilities opened up by Construction 4.0 give players in the construction industry all kinds of ways to boost their productivity. A glance at other industries shows that these new approaches and tools do indeed affect every link in the value chain. Depending on their maturity, size and business model, digitization thus holds out potential for every corporate group in the German construction industry. 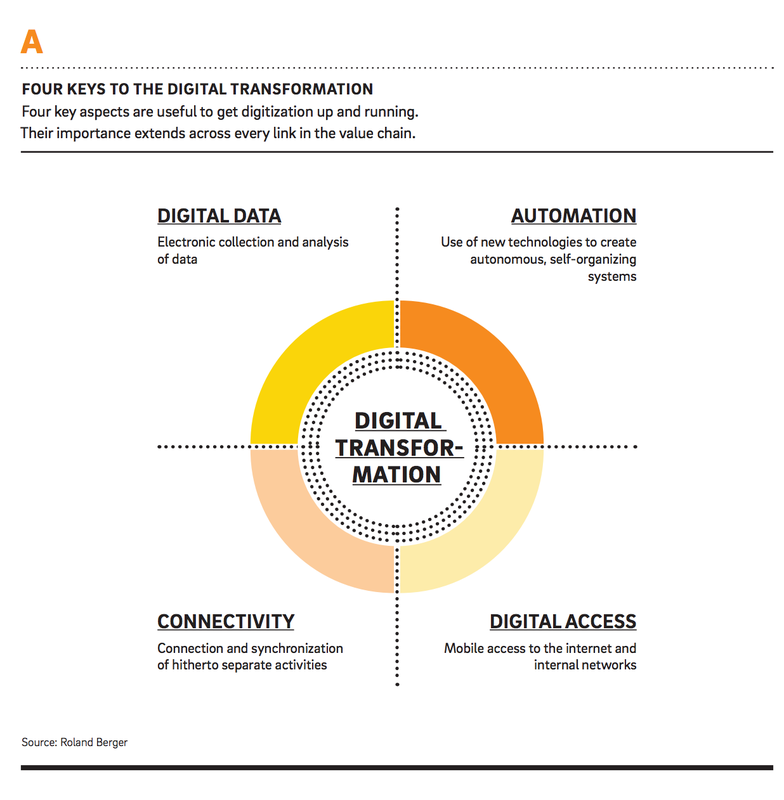 We have identified four keys to unleash the potential of digitization: digital data, digital access, automation and connectivity. And each of these keys can be turned at each link in the value chain: in logistics, procurement and production, in marketing and sales, and in after-sales and end-customer marketing. Companies face the challenge of deciding which approaches suit them best and how they can be implemented. Ignoring digitization entirely is not one of the options. Recent developments in construction and other branches of industry show that there is no stopping the megatrend toward digitization. It follows that players in the construction industry who move quickly to concern themselves with technological developments and think carefully about how to implement them all along the value chain have every chance of setting themselves apart from the competition. 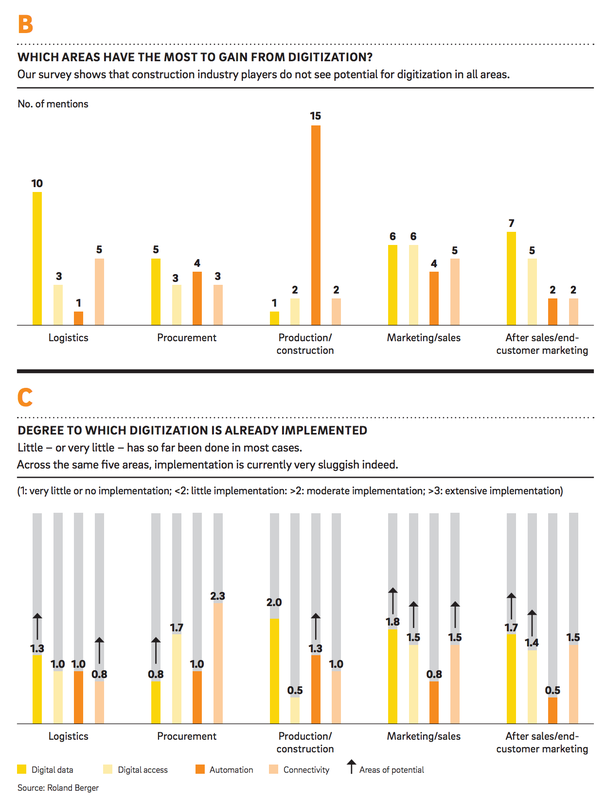 By introducing digital methods, these firms will become more productive and more effective. On the other hand, companies that ignore the keys to digitization run the risk of falling behind their rivals. One reason will be the loss of business. Another will be that they cannot improve their productivity as they would like to.